Solar Panels are by default always exposed to nature. As a result they are also exposed to various elements of nature such as sun, dust, wind, birds’ feces, rain, humidity etc. Residential solar panels placement is no different from the normal household windows. They are lying flat or at a slight angle which means the rate of getting dirty is also significantly faster and their parts might also get damaged. 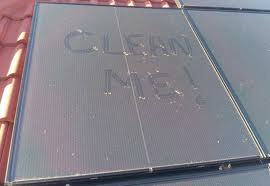 Bird excrements, dirt, pollen and dust are attracted on the surfaces of solar panels. The terminology used by the manufacturers of solar panels “Clouding” refers to the fact that they do get dirty and as a result they have to be cleaned and visually inspected on a fixed schedule so that the full capacity of power generation is not hampered. The reported decrease in solar output is estimated from 10 to 25% for dirty panels. This translates also into a significant loss of income and that is why solar panel maintenance is necessary. What kind of maintenance do solar panels need? In general a photovoltaic system does not have any moveable parts. The photovoltaic energy system and the components they make it up represent an accomplishment of solid state power electronics. The nonexistence of moveable parts and mechanically replenished fuel supply system or combustion makes photovoltaic installations almost maintenance free or at least making most of the necessary maintenance into preventive action and simple visual inspections. Immediately after installation a solar photovoltaic system captures sufficient energy from the sun and thus produces electricity. As already mentioned though, these photovoltaic modules get coated with dirt and birds droppings. Birds rest for the night over these panels and add filth further to the already soiled panel’s surfaces. As a result all the above mentioned will reduce solar panels efficiency significantly with maximum percentage estimated at 25%. Rainfall washes the deposited dirt/filth effectively to some or greater extent from any array having tilt angle of more than 15 degree from horizontal axis. In case of scarce rainfall areas or the array is located in an area of heavy dust fall or dust deposition then manual cleaning is required and of course the stacks of industries and any brick kiln are needed to be monitored so that adverse impacts on solar panels/fixtures is worked out. A common way of cleaning the surface of slightly dirty solar panel is with the usage of a hose pipe but not during the hours that the sun is hot since you can crack the panels. In case of heavy deposits of dirt and filth the best can be washing with soap and water, a bit of lukewarm water wash can clean even the heavier deposits from the surfaces. Cleaning has to be done carefully so that the water does not enter into the junction boxes so electrical connections are not hampered. For the fixtures mounted on ground, always use a ladder to reach the far off modules and work with a soft mop or sponge on an extended handle. Always refrain from using abrasive cleaners and hard bristle brushes or cleaning pads or any kind of abrasive cleaner; mild soap should do the trick. If you scratch the glass surface of module, you will be creating a bigger problem far than dirt. Scratched glass capability to transmit light is permanently decreased and the cells under it will never be able to function at its top efficiency rate. Ensure that modules are attached to the frame, and check the frame for corrosion. Inspect junction box for cracks and moisture. See if the cable connections in the MJB are not loose. Re-tighten them. A multi meter is best to use to see that the bypass or blocking diodes have not failed. Make a record of voltage at the terminals. If the system is working, measure battery voltage. If voltage is zero the fault is between the module and the batteries. Test the wiring for open circuit. If battery voltage is okay, check for the current flow between module and battery, using tongue tester. Disconnect the outgoing terminals from MJB. Short the terminals of module and check Isc. Otherwise the cable between module and array junction box is defective. All the above tests are done under full sun shine. If required cover the module with a cloth and disconnect the outgoing terminals at the JB. Now measure Voc and Isc of modules under full sun light. If Voc and Isc both are close to rated, but on load current is not flowing, defect is in the outgoing cable as AJB voltage more than MJB voltage; it might mean that module is defected due to soiling.